Book Riot has been feeding by Overdrive queue lately, and I am loving it. Following their excellent recommendation of "The Adoration of Jenna Fox," I listened to the All the Books! 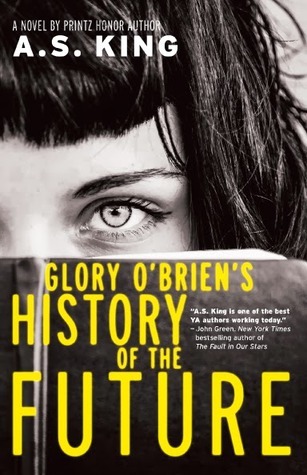 Podcast episode on dysfunctional families, which recommended "Glory O'Brien's History of the Future." Glory and her best friend Ellie drink the powdered remains of a petrified bat and are given glimpses of the past and the future when they lock eyes with people. They see that person's ancestors and descendants. Through these visions, Glory pieces together the story of the second American Civil War, fought over women's rights. She begins to write down the story as a warning, and to figure out her and her family's role in that war. Yes, it's a strange premise. If you can get accept this, and other strange premises, you're in for a great novel. Behind the visions of the future and the coming civil war, is a grounded, relatable, believable story about familial relationships and how our parents' decisions shape us, much like "The Adoration of Jenna Fox." Jenna's mother committed suicide when she was young, and her artistic father has stopped painting. Jenna has begun to explore photography, her mother's chosen medium. Through her mother's dark room, Jenna begins to form a fuller image of her mother, and learns of her parents' relationships with Ellie's parents, who run the commune across the road. Through visions and her mother's belongings, Jenna sees how the past has shaped the present, and how her current decisions will shape the future. Verdict: Affirmed. Either of these two stories - the visions and coming war, or Jenna's family exploration - would have stood just fine as separate novels. Woven together, though, they make an even stronger whole. Audio narration is also superb. 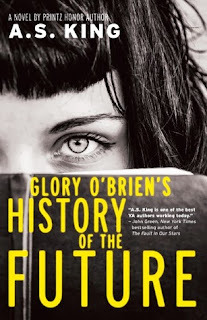 "Glory O'Brien's History of the Future" by A.S. King, published October 14, 2014 by Little, Brown Books for Young Readers. Audio narration by Christine Lakin, published October 14, 2014 by Hachette Audio.